Not so long ago, right before my kitchen got ripped out, Mr. Prevention and I had a hankering for some tacos. 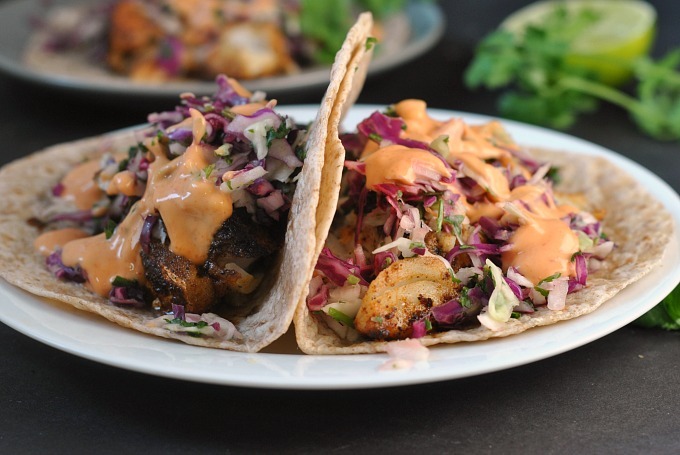 And not just tacos, but fish tacos. We’re lovers of seafood and all Mexican food, so it’s really an obvious choice. Not so long ago, we were also talking about our next vacation – one that we will take many months from now. Do we go back to our most favorite Mexico destination, Cabo – or do we head back to Scottsdale for a southwest vacation in the states? First world problem, don’t I know it. But I daydream lots about vacation. The food. The drink. The sleep. The reading. I lust after these moments and yet, when they present themselves to me, I’m sitting there thinking about my kids and my predictable, ordinary day-to-day life that I love so very much. Please tell me I’m not alone in this. Just a few weeks ago, our babysitter canceled on us last minute and so we took both kids to a local brewery for dinner. We were sat next to a table with two couples that were quick to inquire about the age of our girls and proudly tell us the ages of their children, sharing that they were having a kid-free weekend away in Michigan. You could tell by the look in their eyes that they missed their little bundles of busy-ness and joy. It’s such a blessing and a curse to have that time away, and yet, it’s so important to break away and be a bit care-free every once in a while. Cabo and Scottsdale, we’re talking about you. The good news is we can get tacos in either vacation destination, but the truth is that tacos in Cabo are better than tacos in Scottsdale (at least that I can attest to). 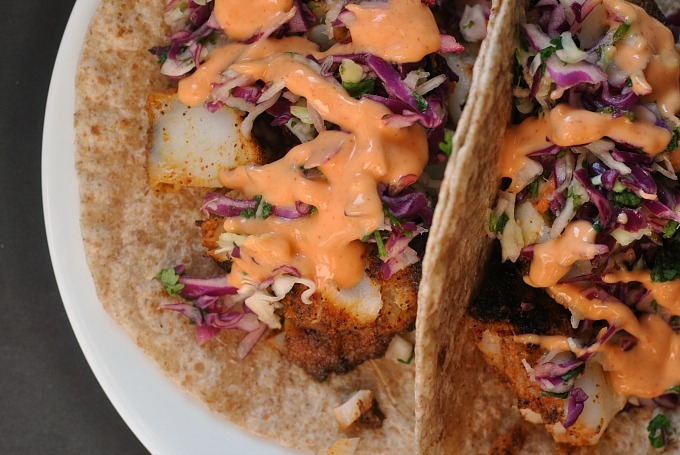 The fish tacos, specifically, are out of this world. As in, eat-them-poolside-every-day-for-a-week out-of-this-world good. 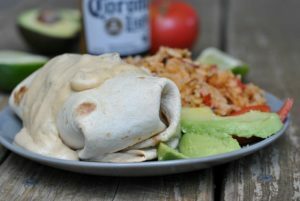 And since calories don’t count on vacation, the experience is only complete with a cold beer or margarita to accompany. But since we’re definitely not on vacation and since I knew my kitchen would be out of commission for some time, I made these tacos as a final “hurrah”. The result? Fabulous! I upped the spices and added a sriracha mayo that is finger-licking good. You’ll love the textures and spice, I promise! In a small bowl, combing the chili powder, paprika, cumin, garlic powder, onion powder, pepper, salt, and cayenne pepper. Rub the spice mixture on both sides of the fish and set aside. In a large skillet or cast iron skillet, heat the olive oil and butter until the butter is bubbly and hot, swirl the skillet to coat the bottom with the olive oil and butter. Add fish and cook 4-5 minutes per side or until fish is cooked through and charred. Meanwhile, combine all ingredients for the slaw in a medium bowl; set aside. To make the sriracha mayo, whisk together all of the ingredients in a small dish; set aside. 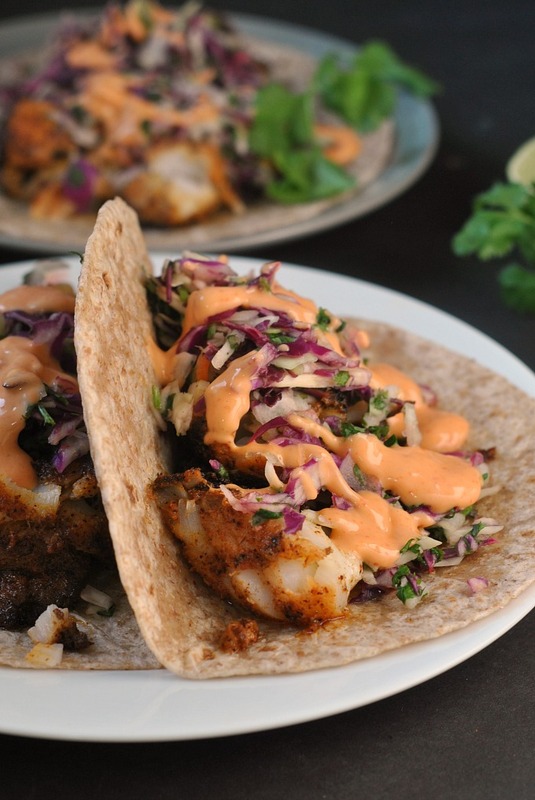 To assemble the tacos, place 3 ounces of fish in each tortilla. Top with about ¼ cup slaw and 1 tablespoon srirach mayo. Serve immediately. 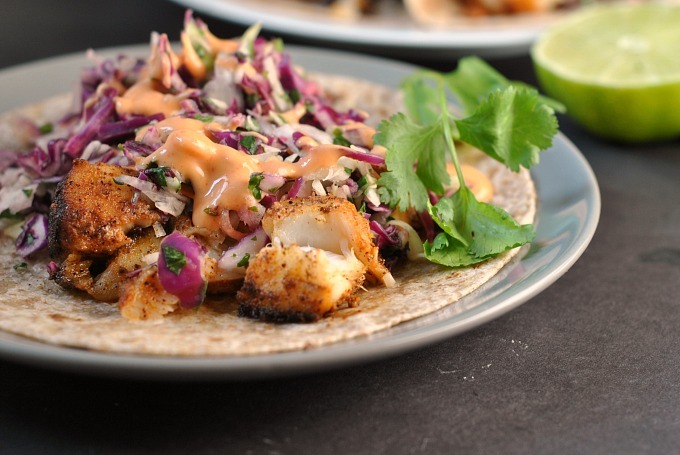 I should really give that fish taco a try in my own kitchen. Thanks for posting this! Delicious, Thank you so much…. 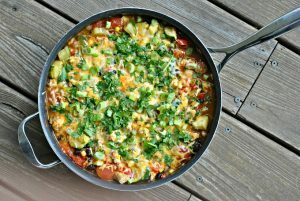 Just came across this recipe and we tried it and loved it! We followed everything exactly, and it was so so good. A new favorite – thank you! Tried this tonight and my family loved it! Thanks! It’s hard to find a dish my entire family likes. So glad it was a hit, Kecia!! Fantastic! Tastes super authentic! Husband said he wanted to make love to me after eating it. Therefore I will be making it again next week ? Since finding this recipe, I have made these twice and they are PERFECTION even with cheaper haddock that was on sale at our local grocery!